The weather hasn’t been great here in Britain, especially in the north where I am. In fact it’s been a classic British Summer where it rains most days. It has however been warm and humid or as we call it “sticky” weather. So to cool down I’ve been making iced tea. There are 2 ways of making ice tea, the first is you make a normal cup of tea with boiling water and let it cool in the fridge. The other way is cold stewing, where you add cold water and let it seep overnight. Both are good ways but I prefer cold stewing as it leaves a less bitter drink. Any nice loose tea will work but I recommend something floral and fruity. I’ve been using Blue Lady from Farrers tea shop, please no tea bags. In a plastic sealable container measure out the loose tea and pour over the water. seal with the lid and let to seep for at least 6 hours but it is better left over night. To make the simple syrup add 2 parts water to 1 part sugar in a pan and simmer and stir over a low heat until the sugar has dissolved. Let cool and transfer into a bottle to be used later to sweeten the tea. I’ve recommended 200ml water and 150g sugar, which will make more than you need to sweeten the tea, but it will keep in a sealed bottle for at least week. After the tea has seeped, strain through a tight mesh sieve into a jug. Transfer some of the tea into an ice-cube tray and put in the freezer. This will mean that the tea doesn’t dilute when the ice melts as just water ice cubes would. Keep the rest of the tea in the fridge until ready to use. To serve add some of the simple syrup to the jug of tea and taste. Keep adding a little at a time until you have enough sweetness as you can’t take it back out once it’s in. 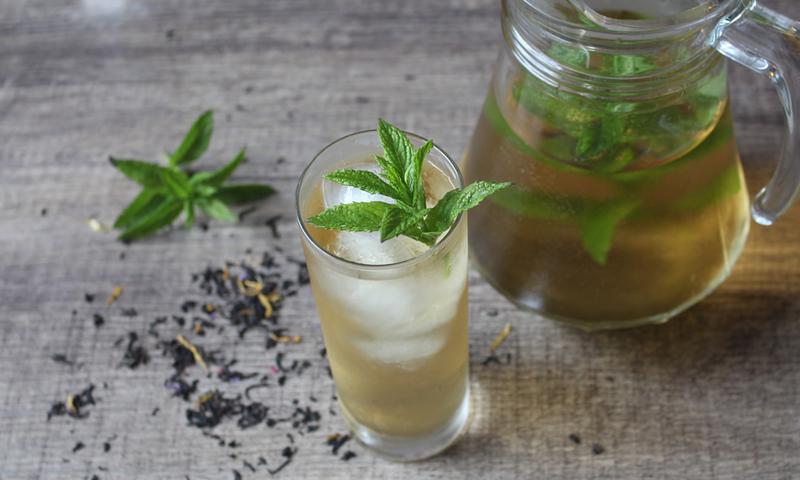 Serve in a glass with lots of the tea ice and garnish with mint and lemon if using.